Up early today, figured I might as well do a little stamping! I will regret staying up by this afternoon, but I probably wouldn't have been able to sleep after having been up for over an hour getting Ryan off to his Robotics meet. 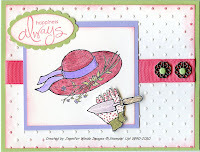 Anyway, here is the card I did this morning for the Stamping 411 Saturday Sketch Challenge . I've been wanting to try this new set from the Occasions Mini, Garden from the Heart. I'm also in the mood for Spring so I chose some lighter colors. Card base is Certainly celery. I used the new Perfect Polka Dots Impressions folder in the Big Shot for the background and sponged the edge lightly with Regal Rose. A Regal Rose grosgrain ribbon is attached around the center with Filigree brads on the edge. I used Certainly Celery brads in the center instead of the silver ones. The hat image was stamped with Black Stazon in the center of another piece of Whisper White. I colored with my markers in Regal Rose, Almost Amethyst & Certainly Celery. I stamped the glove & shovel image on a scrap piece of Whisper White, colored and cut it out. Its attached on the lower corner with a dimensional. The saying is from the SAB set, Whimsical Words and was stamped in Regal Rose, punched with the large oval punch & layered onto a Certainly Celery scallop punch. Now, off to the rest of the day, which I hope includes MORE stamping! One of my very favorite sets from the Mini. Love the look you've achieved here. So soft and pretty! Oh it's so cold outside, this makes me feel like spring is coming! Beautiful job! I can't wait for the ground to defrost and for me to get some gardening done. Your card is like a breath of Spring air. So pretty!! This is so fresh and springy - great colors! Thanks for playing along this week! I love th eperfect polka dots and the way you cut out the gloves and made them pop. Just an all around beautiful card. I love everything about it! Love it!! This card and stamp set makes me really want warm weather!! Thanks for playing along with us this week over at Stamping 411!! I haven't played with this set yet...love your card...spring WILL get here (sometime...) lol! Thanks for playing along with Stamping 411 this week!